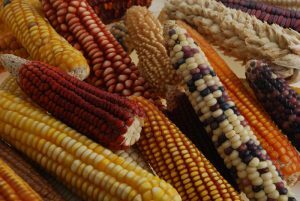 Scientists have unlocked evolutionary secrets of landraces through an unprecedented study of allelic diversity, revealing more about the genetic basis of flowering time and how maize adapts to variable environments, according to new research published in Nature Genetics journal. The discovery opens up opportunities to explore and use landrace diversity in new ways to help breeders adapt crops to climate change and other emerging challenges to crop production. Farmers worldwide have been ingeniously adapting landrace maize varieties to their local environments for thousands of years. In this landmark study, over 4,000 landraces from across the Americas were analyzed and their DNA characterized, using recent advances in genomics. A unique experimental strategy was developed to study and learn more about the genes underlying maize adaptation by researchers with the MasAgro/Seeds of Discovery (SeeD) initiative. Significantly, the study identified 100 genes, among the 40,000 that make up the maize genome, influencing adaptation to latitude, altitude, growing season and the point at which maize plants flower in the field. Flowering time helps plants adapt to different environments. It is measured as the period between planting and the emergence of flowers, and is a basic mechanism through which plants integrate environmental information to balance when to make seeds instead of more leaves. The seeds form the next generation making flowering time a critically important feature in a plant’s life cycle. Over the next century, increasingly erratic weather patterns and environmental changes projected to result from climate change mean that such crops as maize will need to adapt at an unprecedented rate to maintain stable production globally. “This research offers a blueprint of how we can rapidly assess genetic resources for a highly variable crop species like maize, and identify, in landraces, those elements of the maize genome which may benefit breeders and farmers,” said molecular geneticist Sarah Hearne, who leads maize research within MasAgro/SeeD, a collaboration led by the International Maize and Wheat Improvement Center (CIMMYT) with strong scientific partnerships with Mexico’s research institute for agriculture, livestock and forests (INIFAP), the Antonio Narro Autonomous Agrarian University (UAAAN) in Mexico and Cornell University in the United States. The groundbreaking study was supported by Mexico’s Ministry of agriculture and rural development (SADER) through the Sustainable Modernization of Traditional Agriculture (MasAgro) initiative. Additional support from the United States Department of Agriculture – Agricultural Research Service, Cornell University, and the National Science Foundation facilitated the completion of vast quantities of data analysis. “The knowledge we have gained from this work gives us something similar to a manual of ‘how to go on a successful treasure hunt;’ within the extensive genetic diversity that exists for maize. This knowledge can accelerate and broaden our work on developing resilient varieties, building upon millennia of natural and farmer selection in landraces,” Hearne added.